Like crowded subways, sirens, and sky-high real estate prices, rodents are simply a reality of daily life in a big city. And while Ratatouille tried to get us to believe they're cute, charming, and industrious culinary pioneers, the truth is that city rats are potentially disease-carrying creatures that'll stop at nothing to find food. Still, the beady-eyed pests seem to prefer some hubs over others, and thanks to a new study, we now know exactly which cities have the worst rat problems in the United States. 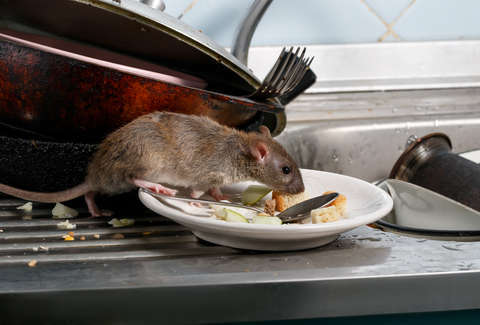 The new list comes courtesy of the pest control experts at Orkin, who consulted their internal stats to determine where exactly rats pose the biggest nuisance this year. Specifically, they identified the 50 metro regions where they've performed the highest number of residential and commercial rodent treatments in the past 12 months and ranked them accordingly. The award (if you can call it that) for rattiest city in 2018 goes to Chicago, which marks the fourth consecutive year the Windy City has earned such a distinction. Meanwhile, Los Angeles took the No. 2 spot, and New York comes in as the No. 3 most infested city. You can peep the full lineup of 50 here, but this (see the list below) is how the top 25 rattiest cities ranked. While seeing the famously rat-popular NYC near the top of the list is not that surprising, it's worth noting that the Big Apple actually moved down a spot to No. 3 from last year. However, some cities seem to have experienced quite a significant rodent boom in the last year. For instance, Cleveland jumped five spots to enter the top ten this year, and Portland, ME and Charleston, WV moved up a whopping 19 and 17 spots, respectively, since 2017, according to the report. In addition to the rankings, Orkin also reports that the rodents enter a terrifying 21 million homes every single year in the US in search of food and shelter, especially when the temperatures drop. Then again, their desperate measures may not be too shocking when you consider they've been known to break into ATMs and eat money until they die.